With the delicate combination of chicken and liver, your small dog can enjoy extraordinary taste and nutrition in every delectable bite. This pâté-style loaf with chicken and liver provides complete, balanced nutrition and a source of moisture that can be beneficial to small dogs. Gram-for-gram, wet foods like the CESAR® brand have fewer calories than dry food. Paired with CESAR® Dry food, the 100g serving makes a perfect meal for small dogs. 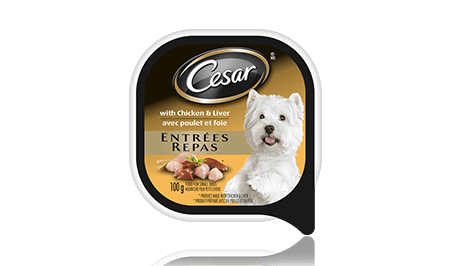 CESAR® ENTRÉES: WITH CHICKEN AND LIVER 100g is rated 4.5 out of 5 by 66. Rated 4 out of 5 by KARINELQC_3571356925 from This special product is evidently of premium quality and if you want to ensure that you are giving your beloved animal a treat that will definitely spike up their senses and thank you for being their best friend - this is your best bet! I gave my animals Cesar's Entr�es to replace their usual pet food and it was gone in a flash, I suppose the taste was up to par according to my pals. Digestive wise not a problem - none of them had any problems whatsoever consuming Cesar's and hours later with a few naps in between they were happy as dogs can be (maybe they were anticipating that I had another Entr�e hidden somewhere!). I love the fact that as an enviro-friendly consumer the packaging made out of recyclable materials has minimal impact on Mother Nature. Should you want to purchase this product I would definitely recommend. Rated 5 out of 5 by SUSANBON_3571299647 from My own dog plus two others that were staying with me at the time are all very fussy eaters and I often find myself throwing away unfinished dog food. I let them all taste the Cesar with Chicken and Liver plain and they LOVED it! Now just a spoonful on top of the regular food does the trick...no more waste. Plus the Cesar food seems to be totally agreeable to my dogs sensitive dietary needs. Rated 4 out of 5 by Natacha from My Dog loves it ! My 9ry old 5 pound dog loves this! She’s a picky eater when it comes to dog food but absolutely loves all the Cesar wet dog foods. She’s got tiny teeth so it’s hard for her to eat dry dog food . I was a little concerned about switching her to wet food (worried about bowel movements ) however , there was no change in her bowel movements by switching . I give her half a can twice a day . Rated 5 out of 5 by SHIRLEYFON_3571303305 from My dogs loved the Chicken and Liver Cesar Entree wet food. It was moist and the aroma smelled great. Both dogs were by my side as soon as I opened the lid. The content was split between the two dogs and mixed with some dry kibble. Everything was gobbled in not time. One of the dogs could not get enough so she went over to the other dog bowl and licked it spotless. Rated 5 out of 5 by BRYANNASAB_3571354301 from Its the perfect amount for my dog to consume in one day ! She happily devoured it fast, shes a chihuahua, very picky about what she eats. I was concerned about feeding wet food to her since i nornally just feed her dry food but im pleased to say her bowels didnt change from being fed this wet food, ill definitely buy more to give her diet more variety. Rated 5 out of 5 by LEIGHMNS_3571300392 from Small container packed full of goodness. Milo enjoyed it very much. Although at this time her usual food is a dried pellet, as she ages I think that this could be an excellent food to switch her to. For now it remains as a treat for her, but when the time comes, I will definitely add Ceasar to our dogs menu. Thanks very much for the coupon. Rated 4 out of 5 by KARENBON_3571299494 from My Chihuahua is a very picky eater. He wasn't really that interested. Although this is a great brand of food,he wasn't really interested in eating the whole portion although he did try it which is better then most brands. I think he would eat just a chicken portion. I think he was not fond of the liver. Rated 5 out of 5 by JENNIFER_WON_3571308464 from My dog loved the Cesar's wet dog food. I mixed it with his kibble and he ate it so quickly! Cesar's is great for mature dogs that are losing their teeth like mine as it is easy for them to chew the food and digest, but also softens the kibble. CESAR® Entrées With Chicken & Liver Food For Small Dogs is formulated to meet the nutritional levels established by the AAFCO Dog Food Nutrient Profiles for maintenance. MEAT BY-PRODUCTS, CHICKEN BY-PRODUCTS, CHICKEN, LIVER, MINERALS AND VITAMINS, GUMS, DRIED YAM, NATURAL FLAVOURS, COLOURS, SODIUM NITRITE (FOR COLOUR RETENTION), WATER SUFFICIENT FOR PROCESSING.